A redescription of Philometra globiceps (Rudolphi 1819), the type species of Philometra Costa 1845 (Philometridae), is provided on the basis of specimens collected from the gonads, stomach, pyloric caeca, intestine and gallbladder of the marine fish Uranoscopus scaber Linnaeus (Uranoscopidae, Perciformes) caught in the Ionian Sea off Ugento, southern Italy. Light microscopical and scanning electron microscopical examinations (latter used for the first time in this species) of the specimens revealed some previously unreported morphological features, such as the location of submedian pairs of cephalic papillae of external circle on four elevated cuticular lobes in gravid females, the presence of amphids, genital papillae and phasmids in males, the lamellate structure of the distal end of gubernaculum appearing as a dorsal protuberance in lateral view and the structure of the male caudal end. A taxonomically important feature of P. globiceps is the details in the dorsal transverse lamella-like structures on the distal end of the gubernaculum, by which this species can be separated from other gonad-infecting species of this genus. Apparently, P. globiceps is a specific parasite of U. scaber and all previous records of this species from hosts belonging to other fish families are evidently based on misidentifications. This study was originated by the fish sampled within ANISAKIS Project, European Fisheries Fund—EFF 2007–2013; project leaders were Prof. Antonella De Donno (Laboratory of Hygiene) and Prof. Antonio Terlizzi (Laboratory of Marine Biology and Zoology), both from the University of Salento, Lecce, Italy. 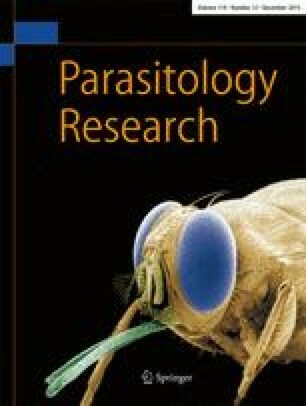 The authors’ thanks are also due to the staff of the Laboratory of Electron Microscopy, Institute of Parasitology, Biology Centre of the CAS, České Budějovice, for their technical assistance, and to Ing. Blanka Škoríková of the same Institute for help with the illustrations. This study was partly supported by the Czech Science Foundation (Grant No. P505/12G112) and by institutional support (RVO:60077344, Institute of Parasitology, BC CAS).